I remember in my young adult years a common subject of discussion was the “cost of building” a new home in a particular location. I always replied that I had no idea what the cost of building was but had a pretty good idea what the cost of buying was. It was common for a person to say, “We just built a new home,” when what actually happened was that he or she bought a new customized home from a general contractor who hired and paid several sub-contractors to do various parts of the “building” and who, quite logically and ethically, priced the home to maximize general contractor profit. It was competitive, and a buyer was free and well advised to get quotes from two or three general contractors before signing with one based on reputation, price quoted, and some judgment about how the relationship might progress under the stress of such a large and expensive project. I did observe one builder who actually knew the cost of building. He lived in our neighborhood and built new homes, pretty much single handed, hiring hourly help as needed. He bought materials and built foundations, framed, roofed, plumbed, wired, drywalled, painted, etc. It was amazing to observe the process, his construction sites always neat and uncluttered and perfectly organized. The gossip in the neighborhood was that with completion of each home, maybe a six month process, he purchased a $100K CD for his retirement, that amount representing the value of his personal labor…and initiative. I guess the average home he built was priced around $250K. Cost of health care is similar except that we not only have no idea what the cost of health care is but also have no idea what the price is and have little or no opportunity to get quotes and compare prices. It is mostly out of our hands, and that is the biggest and ugliest elephant in the health care controversy room. Some light was shed on the issue in an article in the February 6, 2017, issue of Time Magazine: Why the Doctor Takes Only Cash. It has been lying on my desk for five or six months, and I finally decided to publish some comment on it in the heat of the current negotiations over the “repeal and/or replace” controversy. The text of the article can be found here, though the charts are not included. The article focused on fixed price clinics that accept cash only, directly from customers, and do not deal with any insurance companies or government agencies. These clinics offer a single, all inclusive, fixed price for various procedures and want a check or credit card up front. 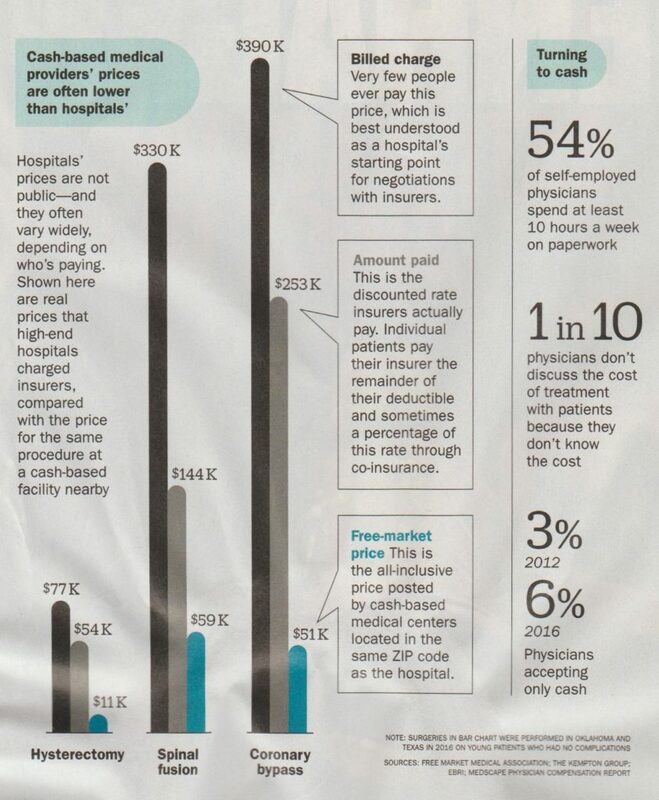 Here is a simple price comparison chart that was included in the printed issue of the magazine. Both the data and the notes are interesting. And, if there is no insurance, the providers enjoy presenting their customers with the hideously inflated bills based on their sticker prices or so-called chargemasters. If only we could have a free and competitive health care market with price transparency and with people dealing directly with their insurers to reimburse their actual expenses rather than a rigged marked in which insurers and providers carry on expensive and time-consuming negotiations in secret and then let us know, a few months later, what happened. Of course the standard objection to free markets is that the poor don’t have credit cards and checking accounts with big balances. Yes, but if health care were covered for them the same way food and housing, the other two necessities, are, reimbursements or cash advances for spending in freely competitive markets, cost for health care including all the red-tape, paper processing, and regulation would decrease dramatically, the health care professions would become more attractive, and there would be more doctors and nurses and hospitals and better processes in place. Incidentally, we do have a pretty good idea of the “cost of health care,” red tape, claims processing, and regulation included, on a macro basis. It is about 18% of GDP, much higher than in other nations. There are two ways to get it down. Increased regulation with strict rationing and limitations on freedom is one. Free market competition is the other. And, if you need some medical procedure, take a look at this website for Surgery Center of Oklahoma to get a free market competitive price. Next Post Irrational Government Meddling: Stop It! South Carolina has a department, Certificate of Need, for healthcare that, to me, completely stifles competition and leads to higher healthcare costs. The government in its infinite wisdom apparently thinks competition is a bad thing in healthcare. A Certificate of Need employee I know has said that healthcare providers will try and charge the highest price for their services so adding more and more services will cause higher and higher prices. I find that to be completely contradictory to the reality of a free market approach. Reminds me a little of when the price of milk was artificially propped up by the government to insure the availability of milk. That program ended some years ago and now I pay less for milk and the supply has not diminished in any way. Enjoyed the commentary and comment.. Just wondered why it is an Elephant and not a Donkey??? But think how many no value added paper shufflers would be put out of jobs if this all became efficient.